Sweating is healthy! Allowing the sweat to pour out of you in a steam room or sauna is one of the best ways to speed up your Organic Detox™ and alleviate Detox Symptoms or Healing Crisis. Once you've stirred up all those toxins through The Organic Detox™ you've got to get them out! And your skin is one of the best routes. Your skin is your biggest elimination organ. It is often referred to as the third kidney. Sweat and urine have very similar chemical compositions and they are both waste products of your blood. When your kidneys are overworked by toxins your skin has to pick up the slack. Sweating detoxifies your body, by removing the accumulation of potentially carcinogenic heavy metals as well as alcohol, nicotine, sodium and cholesterol. Profuse perspiration also deeply cleanses the skin, creating beautiful and improved tone, texture, and color. 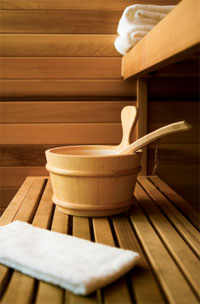 Steam and sauna purges harmful pathogen and toxins while fortifying your immune system. During a 15-20 minute session your pulse rate can increase from an average of 75 beats per minute (bpm) to between 100-150 bpm. This increases blood circulation, without blood pressure, so it strengthens your cardiovascular system. The most effective way to get yourself sweating and releasing toxins is to do a sauna. Sit in the sauna for 5-10 minutes then take a short cold shower. That is round one. Repeat a few times until your sweat is flowing. As you do this, your pores will open and your skin will wake up. With each session your sweat will start sooner and be more profuse, flushing out the toxins more and more effectively. Stay hydrated while sweating. Be aware that you may become lightheaded, so stand and walk carefully. Refrain from using any sweat therapy if you have a heart condition or other serious illnesses. If you do not have access to a steam or sauna, try this easy home treatment. Use hot and cold shower water to stimulate the sauna sessions described above. Take a hot shower, as hot as you can tolerate, for 5 minutes. Then turn the water to the coldest temperature that you can tolerate for up to one minute. Alternate several times. It is also effective to simply end your hot shower with a 30-60 second blast of cold water. This will stimulate your lymphatic and immune system. Make sure to expose your armpit and groin areas to the cold blast to best stimulate a detoxifying reaction.